Marie Johnson, who died Friday at the age of 85, was known as “The Flower Lady” because of her many generous flower donations to dozens of local charities. 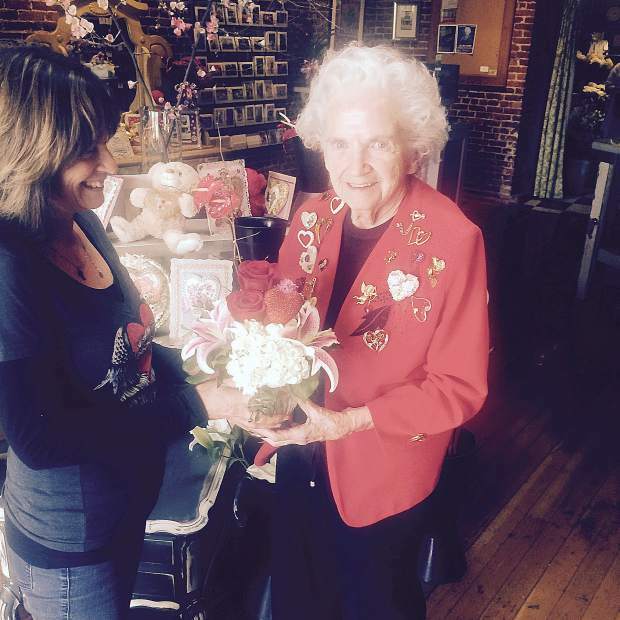 Marie Johnson, the owner of Foothill Flowers for more than 50 years and best known as “The Flower Lady,” has died. Marie, 87, passed away Saturday morning at her Grass Valley home in the company of her adult sons, Mark and Todd. She was predeceased by her daughter Beth. Marie grew up in Indiana and moved to Sacramento in 1956, where her talent and flair for designing stunning floral bouquets and arrangements were in high demand. After a divorce in 1965, Marie was determined to raise her three young children in a safer, smaller environment than Sacramento. In 1966, Marie moved her young family to Cedar Ridge and opened Foothill Flowers in downtown Grass Valley. She possessed the boundless energy and patience of a single mother raising three children under age 6, plus the grit and determination of a businesswoman during the Gold Rush era, when businesswomen were not common. “She started with a picnic table, a small walk-in refrigerator, and a 1964 Volkswagen bus for deliveries,” said Mark. Marie was known as “The Flower Lady” because of her many generous flower donations to dozens of local charities. She had another nickname, born of tragedy but earned through love. Marie’s daughter, Beth, was a Nevada Union High School junior who died in a 1976 car accident. Marie became affectionately known as the “official mother” of Nevada Union’s Class of 1977. “I was there with Marie the night Beth was killed,” said Cecelia Riley, a classmate and close friend of Marie’s only daughter. “Even afterwards, Marie stayed so connected to our class. She wanted to know about every event and always sent flowers in Beth’s favorite colors to every class reunion, almost like it was a part of Beth being there with us. Marie also suffered a nearly-devastating professional loss. In May 1984, Foothill Flowers was gutted by fire just before Mother’s Day, the busiest day of the year for the floral industry. With the help of her sons, Marie established a temporary worksite in the basement of the Old Post Office Building and delivered all her customers’ orders in time for Mother’s Day. The family then worked diligently for 11 months to restore the brick interior and redesign the flower shop. Marie’s commitment to the downtown corridor and its historical significance never wavered. The renovated building was later designated a local landmark, and in 2013, the California Heritage Council recognized the building as an exemplary example of historical preservation. Foothills Flowers continues to be an icon of downtown Grass Valley, and just a few doors up Main Street, so does Williams Stationery. “Marie was a single mom back when it wasn’t in vogue like it is today,” recalled Williams. “She was raising three kids, running the business, and then she had the tragedy of losing her daughter. Later, the building burned down. Williams added that Marie sent flowers to his mother, Helen, on her birthday every Fourth of July. Although Helen Williams passed away in 2012, Marie continued to send a birthday bouquet. Just a few months ago, Marie and her family received the Dame Cicely Saunders award from Hospice of the Foothills, an honor named for the woman who founded the modern hospice movement. Marji Kerhart said that since 1996, Marie donated or delivered at-cost flowers to the organization’s quarterly luncheons. Paul Matson, former Nevada City Mayor, became acquainted with Marie when he and Mark Johnson were mayors of their respective cities. Matson noted that Foothill Flowers’ downtown location is where East Main and West Main streets intersect South and North Auburn streets. Diane Jacobson said every Monday, for 40 years, Marie ensured a beautiful arrangement was delivered to the Dale Jacobson Chiropractic office. “I can’t imagine anyone else in our community who has been such an intimate part of so many of our lives,” said Diane. “Welcoming new babies, saying farewell to loved ones, celebrating birthdays, wedding anniversaries, and graduations, and gracing many a table for the holidays. In 1967, Marie started a tradition of distributing 150 green-themed carnation corsages to restaurant servers and other downtown business people in honor of St. Patrick’s Day. Marie personally delivered many of them. Marie will also be remembered for her annual Santa Lucia festival held every December. For 28 years until its finale in 2016, up to 200 people attended the Scandinavian festival and pageant at the flower shop. After weeks of work decorating the flower shop from the rafters to the floor, Marie proudly served Swedish meatballs and other delights. David Breninger, a former Grass Valley city administrator who emceed the festival, will remember Marie for her caring nature. Marie will be laid to rest next to her daughter at Greenwood Memorial Cemetery in Grass Valley. The family will have a private interment, and a celebration of Marie’s life will be held at Foothill Flowers Sept. 15. Lorraine Jewett is a Nevada County freelance writer who was the recipient of one of Marie’s specialty arrangements in the 1990s that featured a zucchini and floral bouquet at a 4-H Celebrity Chef fundraiser.